I've been wanting to make homemade corn tortillas for a long time. I grew up in Texas and I love the taste of homemade tortillas. Storebought tortillas just don't cut it. It's like eating Wonder Bread compared to homemade sourdough. I also want to be able to make my own corn chips, since there are no chips on the market fried in healthy traditional fats like lard. The easiest way to make homemade tortillas is to use masa harina, which is a corn tortilla flour. However, most brands (Maseca is the most popular) are made with genetically modified corn. I was able to find organic masa harina at an online store. But I called them and they said they only cook the corn with lime for 40 minutes. They do not soak it in the lime water. While it's better than eating Maseca, I don't think that's good enough. In traditional cultures, the corn was soaked in lime water for 1-2 weeks. Besides, corn tortillas made with masa harina are vastly inferior to tortillas made from freshly made masa. And as we know, with whole grains, it is important that they be very fresh in order to retain nutrients and flavor. Most storebought flours (including masa harina) are rancid. It turns out that making your own masa, and your own tortillas, is not very difficult. And it's not expensive either. However, like most traditional recipes, it cannot be done all in one day. So I've broken this post up into 3 posts. 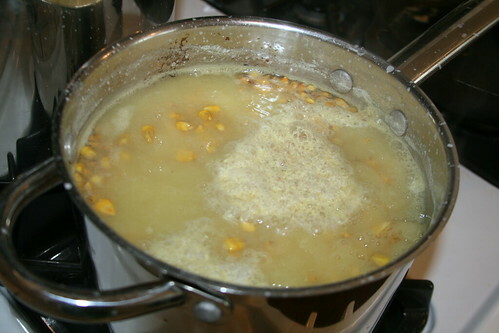 The first step is to cook and then soak the corn in lime water. Then the mixture is washed and ground. Then it is shaped into tortillas and fried. Today we'll start with the initial cooking and soaking. 3. Mix in 1 1/2 tablespoons pickling lime and turn heat on high. 6. At this point, you can transfer it to a glass mixing bowl and cover it with a dish cloth to let it soak (you could also use an enamelware Dutch oven with a lid). It's best to soak in glass or enamelware. I am not sure if it's a good idea to ferment in stainless steel. 7. 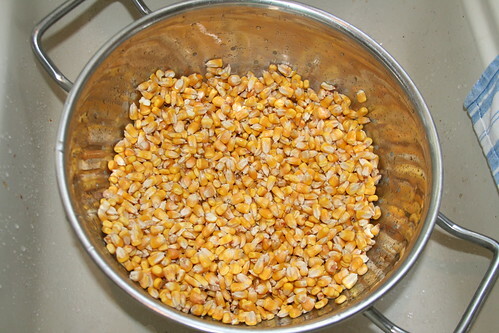 Mix well, cover, and let the corn soak for a minimum of 24-36 hours. Preferably longer, up to 2 weeks. The longer you soak, the more digestible and more nutritious the corn will be. More to come in Part Two, when we'll wash and then grind our nixtamal (the soaked corn) into masa dough. In Part Three, I'll show you how to make the tortillas. thanks for posting on this, i’m excited to give it a go once i learn the process! I can’t wait to see how they turn out. I think I may order some corn. Looks wonderful–I miss the real thing and store masa isn’t real fresh (didn’t know it was made from genetically modified corn, too). I’m eager to see the rest of the process! yeah!!!! A tutorial on corn tortillas! You’d never know my sis is married to a Mexican guy and she is really ;) part Mexican herself! I ordered the corn from Tropical Traditions and I am eagerly awaiting Parts 2 and 3. Oooh goody! The other day we were at a “hole in the wall” Mexican place (read: authentic) and I ordered fajitas w/ corn tortillas. They are hand made (I think the moment before you order) and they were the BEST tortillas ever! So soft and plyable!!! I want to know how to make them myself! Thanks AM!!! Could you also sprout the corn first? When would you add the lime? I really want to try this for DH as he LOVES corn tortillas and corn chips! Only one question…how many cups of corn equals 1 1/2 pounds? Thanks! There are 8 ounces in a cup and 16 ounces in a pound. So 2 cups equals one pound. I just put it on a counter or in a cupboard with a lid or dishtowel covering it. I commend your post for being one of the only posts that accurately defines the process of making tortillas ‘from scratch.’ Most all posts speak of using the short cut, masa harina, as some sort of laborious but highly rewarding process. Compared to the real deal, masa harina tortillas taste like cardboard! I must point out a few technical errors. Firsty, you refer to calcium hydroxide as being ‘acidic.’ This is incorrect. Cal is alkaline, and can therefore be safely used with stainless steel. Transferring the nixtamal to a glass vessel is not necessary. Secondly, you mention that masa harina is rancid by the time it reaches the consumer. This is true. Regarding your practice of fermenting the corn – this is both unnecessary and time consuming. At the end of the two weeks one is not left with what anyone should consider ‘fresh’ nixtamal! An 8 to 12 hour soak time is perfectly sufficient! It is very possible to make and enjoy eating your freshly made tortillas- all within the course of one single day! Thank you for this David Beiszer. I saw this post and I couldn’t find it again when I was making my freshly fermented corn. However, I put the corn in my crock, made sure it was covered with water and put it in my “warm” basement for a while. It was in there for more than a week. It smelled yucky. I don’t know if it was the lime or bacteria. The problem I think was that any good bacteria that was in there was officially gone after the boil. I wonder if one were to add whey or buttermilk to it, if it would have a sweeter smell. I had some left over that wouldn’t fit in my crock, so I left it in the pot with the lid on and put it in my basement as well. WHEW it was stinky and smelled like a brewery! I just made some tortillas tonight with a batch that I cooked up in the lime in the morning and in the evening I ground. I do wish that I would have left it overnight as it was still a little dry for what I was going for. I had to add quite a bit of water. Has anyone else noticed the smell when leaving it longer than 24 hours? I am so excited to try this. I live very close to the border and Mexican cuisine is among my favorites. I was just talking this week about making my own tortillas. I bought a nice cast iron tortilla pan for this purpose. I have a two questions though. 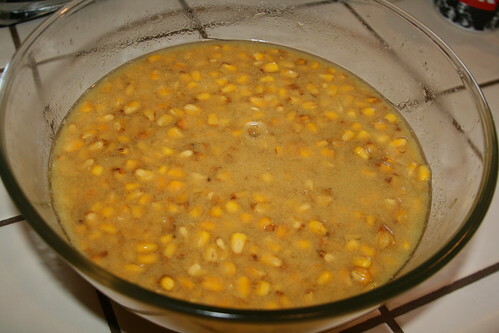 Do you leave the corn mixture in the fridge while it is soaking or outside of it? And when do you plan to get more whole grain corn? Thanks for posting. Wow! I can’t wait to make my own tortillas! Thank you for the tutorial. Can I use frozen sweet corn instead of field (or dent) corn? No, sweet corn will not work. Has to be field or dent corn. Thanks for the tip about the stainless steel. I wrote that wrong. You are correct that it is alkaline. Instead of saying the cal is acidic, I should have just said I don’t like to ferment anything in stainless steel. Nixtamalization by itself (cooking corn in lime or wood ash) is not fermentation. But soaking the corn allows it to ferment, which is a traditional practice. I have a friend from Guatemala. She said when she was growing up, her mother always soaked the corn in lime for 1-2 weeks. No, you don’t *have* to let it soak for days or weeks. However, you are improving digestibility and increasing nutrition by soaking. It’s similar to sourdough bread. Please, can you tell how to rinse properly and what is after that? This is so strange. I wonder if the post didn’t transfer over when I moved my blog. I am checking into it. Iris – I fixed it! Hi- I found your blog and have been reading some of your recipes for the past few days. I have to say I’ve thoroughly enjoyed them and I am very grateful for all the valuable information you are posting. I’ve been wanting to make corn tortillas and have also read a lot of the Weston Price information as well as Ramiel and I am wondering if it is necessary or would it make a difference if one soaked the corn before fermenting or because of the fermenting one does not need to also soak it before hand? I am still a bit confused about whole grains and the proper procedure for cooking them. I am looking into getting Sally’s book soon. Thank you in advance! However, I would love to get dent corn and soak it for tamales!! I will see if I can get corn from my farmer. I didn’t stir it or anything. Just let it be. I have done cornmeal this way but I only do it overnight. I’m not sure if that is the right way to do it. I need to look it up. How do you rinse the cornmeal? NT doesn’t mention rinsing the cornmeal at all. Also, I used all my lime mixture, including the powder that settled on the bottom, is my cornmeal edible anymore? NT said to only use the water not the powder. Please help! My cornmeal is soaking as I type this. Thanks. You may need to add some cornmeal to get the right consistency. All this information about corn is amazing and a boon to a frugal health conscious person like me! I have just tried making hominy with great success using baking soda instead of pickling lime. First I soaked the corn and sprouted it slightly. Then I tried two different methods of preparation: boiling with soda water for a couple hours, and soaking with soda water for two weeks. The boiling method worked great. The soaking method, however, seemed to have trouble. After a few days it looked bubbly, but when I opened the jar it smelled sickening, like sulfur. I make lacto-fermented foods and I’m used to fermentation, but this did not smell right. After the two weeks it was worse and I threw it away. Perhaps I didn’t use enough soda…I may try again. When you ferment with lime, does it smell sour like any fermented grain? I’d think the lime would kill any bacteria so it might not smell the same. How does your corn smell? Hi, thanks so much for this recipe! I have a question, but first, some background info: We picked some ornamental (“Indian”) corn at a local farm this Fall. We soaked some of the kernels (to soften them) so my daughter could string some corn kernel necklaces. The kernels remained damp in a bowl, and a few days later, I noticed that they were all sprouting! Wondering if I could make them into something instead of just throwing them away, I hopped on Google & ended up on this post. So now, my question: could I use these kernels in your recipe? Would this make sprouted corn tortillas? I followed these directions and soaked my corn. After one week all the water is gone. Is it still safe to eat? Should I add more lime water and keep soaking? Does it have to be cooked to be properly nixtimalized? I have been coarsly grinding mine in a blender and then soaking it in lime water. Have I just been wasting my time? Hi, I’m interested in two things. One is getting rid of the phytates and then two, increasing the B vitamins and folate. I think pre-soak/sprouting would be advisable, then go to the lime cooking and resting, After that, to actually let the ground masa sit 18+ hours with a sourdough starter or whey mixed in. The result may be a bit more sour than normal, but the increases in nutrients from true fermentation would be great. Any thoughts? Note: Idlis/dosas – ground fermented rice/lentil mixture. You wonder if traditionally some of the Nixtamal would ferment naturally when it sat out a day or more if they had it left over. Your instructions said to soak for weeks? In Mexico we just soak the corn overnight. The best way to grind the corn is using a corn grinder and then a Metate. Then you will get a smooth dough. I am looking for good instructions to make masa like in Mexico for an american friend. Hi! Do you know if soaking the corn for that long affects the carb content of the final tortillas? Reason for the question is that my boyfriend has high triglycerides, and we’re trying to cut back on the carbs some. I was hoping maybe this would be a lower-carb version of tortillas. Also, what if the corn was sprouted first? I am really excited to give this a try. I am using organic popcorn because that was available in my pantry and non-GMO. Hopefully this will still work! I’ve read posts elsewhere where people have used popcorn sucessfully in grinding it for cornmeal, etc. I just thought that it would be nice to try out since organic, non-GMO popcorn is still fairly available locally to purchase, whereas Dent corn you have to order online to get it organic and pay shipping to boot. I noticed that when the corn was boiling in the lime water towards the end a foam developed on the surface. Not sure if its the same as in meat stock foam being yucky, but I went ahead and skimmed it off. Thank you for your blog, I love it! www.gourmetsleuth.com also sells dried organic field corn. A 5 lb bag is 10.25 (+ shipping). That’s where I ordered mine. I’m now on day 5 of fermentation. Looking forward to trying it. For people in Europe and Australia. You can find the lime powder or Calcium Hidroxide at indian food stores. it is called “Chuna” Edible lime. I’m making this recipe for only the 2nd time. I’m wondering if it would help the fermentation process to add whey? I’d like to try a long ferment, but leaving a ferment for 2 weeks without salt or whey added makes me nervous, especially with the comments above about mold developing. Would whey react negatively with the lime and negate its effects? Thanks for your input. Thank you! I was aware that almost everything with corn or soy is genetically modified these days, so I stopped buying corn chips and tortillas. But I really miss them so thank you for the information. It IS hard to find organic masa isn’t it? I purchased whole grain sprouted corn and I was wondering if I should still soak and cook the corn before making the masa? Thank you for your wonderful information! I don’t think you need to soak it if it is sprouted. You do need to cook it though. Wow! You’re a woman after my own heart (organic corn & real frying lard)! I lived overseas in the 80s and missed corn tortillas so much, then once I figured out what masa was it sounded way too complicated to tackle. I’m beyond thrilled to have found your post. THANK YOU!!! Lard is not healthy. I realize it’s fun to buck conventional wisdom, but you’re taking it too far. I hope to God that you are not feeding this to children. Yes I do feed it to my child, as people have done for thousands of years. we ONLY use saturated fats in our house. Lard, butter, coconut oil, ghee, bacon grease. I am sorry for you and your family. I hope you win the genetic lottery and don’t get sick from this diet. The modern idea of eating man made fats has turned out to be a complete failure as we can all see the information coming out finally about trans fats and hydrogenated fats that the government and food industry experts told us for decades was so good for us. Now some us have learned that saturated fats are good for us. Karen is not alone in this. The benefits of the fats she mentioned are scientifically documented and incredibly good for us. You should do some research on this and you’ll see what I’m talking about. Conventional Drs. are very slow to recommend some of the best health science available and so often still keep saying to eat a low fat diet when it is now clear that is wrong. Oh now who said anything about eating man-made fats, or even a low fat diet? You’re making some large assumptions there. Reasonable amounts of plant fats are where it’s at. And if you tend to gain weight, less of those. Oh, and I’ve done plenty of research including recent college level nutrition, chemistry and biology courses. You are, quite simply, wrong. It’s your privilege to risk your own health with a diet like this, but to predispose children to obesity, coronary artery disease, type II diabetes, cancer and other dietary diseases is simply irresponsible. You’re listening to gurus, not scientists. Sally Fallon and her ilk are not responsible authorities on diet. I suggest that at the very least you read The China Study – I mean really actually read it, not reviews of it, nor excerpts from it – and maybe even follow up a little on some of the references. Plant fats (vegetable oils) ARE man-made fats, unless you’re talking about ONLY eating seeds and nuts. Then the issue of too many Omega 6’s comes into play, and that’s a separate issue. When fermenting the corn for several days (after the initial boiling), does anyone change the water…is that necessary? From what I am reading most just let it sit. With the use of lime….I am trying to remember which kinds of metals react. I used to make watermelon pickles and zuccini pickles and they were soaked in lime and I think that aluminum was one of the baddies…but can’t remember if there were more. Seems like I kept to glass pretty much…any one else here have any input? I’m trying the organic purple corn kernels to do this & found that the kernels did not sink as the yellow did. Is this okay? Omg I love you. Thank you for posting this. I am SOOOOOOO excited. Not sure if this helps, but I prepared my organic dent field corn just as instructed and after the 10 days the corn was prepared and fermented well, but it had a bad smell. It was not spoiled though and cooked up fine, but that smell was maintained. I tried the recipe again but this time I changed out the water (also adding new lime bc I figure, but not really sure, that it keeps bad bacteria from growing), and this time the corn masa came out well with no bad smell at all. The masa had a bit of a bitter taste of lime though. I’m repeating a third time now (day 2 of preparations) and I intend to change out the water again every 3 days but add much less lime each time. Let you know how it goes. Anyone else having bad smell issues too. Thank you for this recipe. I came across it after a web search on why I can’t find organic masa harina. 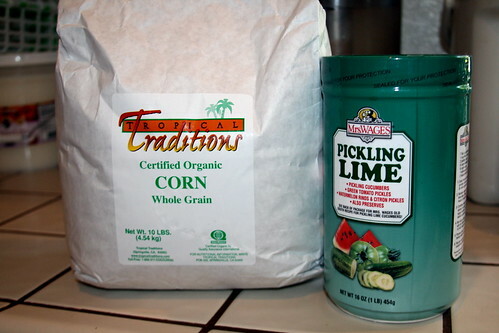 I am still not sure what pickling lime is, and why that can’t be organic in addition to the corn. Anything to avoid the Monsanto GMO monster. I have one concern: So the corn soaks for 24 hours to 2 weeks and does not need to be refrigerated? Thanks so much for this article! Since most US corn including Masa Harina is GMO I was looking for just this article and it is the only one like it on the net. It worked exactly as your recipe explained. I made great tacos and froze half the dough and used it to make super enchiladas a week later! I’m just a reader who is following this discussion. Yes the corn used for this is a dry corn called “dent” corn I believe. It is hard to find and you may have to order it on the internet depending on where you live. If you are avoiding genetically modified corn, you will almost certainly have to order it on the internet unless you have a Trader Joes nearby. They may have it. There are many comments above that are informative also. Thanks for these instructions. I live in Madison, Wi, and the closest source of masa is Chicago. The stuff in tubes at the local Mexican grocery stores is really awful. As a result of reading and practicing your recipe, I finally made delicious tortillas. But, then I wanted to make delicious tamales. I discovered that the noise from the food processor grinding the corn was too loud for me, so I did a little research and bought an Estrella grain mill from a Mexican supermercado in Milwaukee. I tried it out and the grind was so much finer and easy! My tortillas were even better!! I can hardly wait to make tamales this weekend with super fresh masa. Muchisimas gracias!! I was wondering if one could make corn tortilla by using sprouted corn flour? I just simply don’t have time for soaking and all that. Is it possible? This is exactly the information I was looking for. Thanks so much! I can’t wait to try it. Thank you! I left to go on vacation for a week and thought I would set some corn out for that amount of time so it would be ready when I came back.. . it was skuzzy and brown on the top. Does this need to be refrigerated? Or just stirred every so often? I’ve got a new pot simmering away right now, so I am going to try this again with a shorter soak time and see how it goes. Thank you! I live in a very rural area in Panama, Central America. The corn is readily available but the pickeling lime is not. What can I use instead of the pickeling lime? I realize this is an old post but I am wondering if someone can answer a question for me. I purchased what i believe to be ornamental indian corn from a farmers market. The farmer didn’t say what type of corn it was but did say that the latinos use it often. This is dried corn (red, black, multicolored) on the cob with husks peeled and dry but still intact at the end. Could I use this corn for this recipe and if so how would I prepare it? I have heard this corn is much more nutritious so hoping i can use it. I used corn like that one time, but it was old, blue corn still on the cob. I just pushed the corn off the cob with my fingers (it was easy to do), measured it out and calculated how much lime I would need based upon how much corn I had. I made the masa according to the above recipe. It came out alright, but because the corn was fairly old (or possibly b/c of the type of blue corn) I needed to boil it longer 20-30 minutes to make sure it was properly prepared. This is a great masa recipe! I am excited to report that it tastes wonderful and has that satisfying corn tortilla flavor that one can’t get with cornmeal. I used organic popcorn instead of field corn and it worked fine. I cooked it in the lime water for 10 minutes and then put the whole mixture into the fridge for a day. Then I cooked it for quite a bit longer, maybe even a few hours until it was pretty soft. When I tried this before it was just too hard on the food processor but cooking it longer seemed to help a lot. I found the tortillas are the least satisfying way to cook the mixture, too much smoke and effort :) I tend to make them into pattys and fry them, (sometimes mixed with beans in the patty). Or I might throw the masa into soups or line my casserole with it. It also works as a tamale and I discovered that I don’t really need the corn husks. Yum! What is an American tablespoon in ounces, or grams or mls? Here in the UK a tablespoon is 15mls. I followed the directions on this blog and mine turned out pretty wonderful! A. I used popcorn and it was just as good (maybe better?) than the dent corn. B. I soaked mine in the lime solution for 5 days – never got sour or nasty, but I never changed the solution or uncovered it (allowing bacteria in?) to check it during those days. C. Thanks to whomever suggested using the meat grinder! It worked great! I am growing my own corn. Do I need to dry it and then rehydrate it by soaking the corn again? Or am I able to use it fresh? What purpose would drying and rehydrating serve… changing the texture? This seems way too easy (which is awesome!) can you add any spices to your tortillas? How finely ground should the corn be? I love the article, thank you for that. However, I also wanted to tell you that stainless steel can be fermented in, and in fact most red wines have their intial fermentations take place in large stainless steel tubs. This steel is very stable and doesn’t interact with most substances. Thank you for this series of directions. I have wondered about using a food processor instead of the Hand cranked grinder. Maybe Diana Kennedy can do it but I find it too difficult. My understanding of the process includes rinsing the soaked corn while simultaneously rubbing the kernels between your hands to get rid of that covering one always gets stuck in your teeth. This make the dough a little smoother. Do you find not removing this material improves the tortilla or tamale? For years now I’ve read a ton of your posts and really appreciate your work. If I remember correctly, in the comments for this post a while back (before your account was hacked and comments deleted) you said that you learned to ferment the corn for 1-2 weeks from a Guatemalan friend whose family prepared corn tortillas traditionally. Did you happen to ask about the conditions in which the nixtamal was fermented? What kind of container was used, was a culture added (or did the container in which it was fermented have some bacteria already present (such as banana or corn leaves or something along the lines of that), temperature, etc. In particular I am a bit concerned with fermenting something that has been cooked (during Nixtamalization process) and has thus no bacteria on it. I would think that some kind of culture would be added (or perhaps the same container used repeatedly) in order to achieve a succesful ferment. Where did you get your information about soaking the corn for a minimum of 24-36 hours and up to 2 weeks? All the articles that I&apos;ve seen about soaking corn say to soak them only overnight and nothing beyond that. Thank you so much. Since I first made this I always start a new batch of corn nixtamalizing. (Close?) Although I usually make tortillas, I did find a wonderful recipe for tamales for which this masa works beautifully. I am a NEARLY grain free consumer, but lime treated corn is my limit!